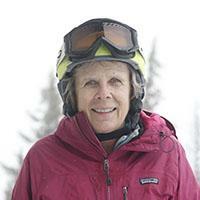 Mjelde taught skiing for over 20 years and was the ski school director at Ski Bluewood, Washington for 4 years. Mjelde is a retired elementary school teacher and in her free time she loves to travel with her family and discover new ski areas. Her new local ski area is Discovery Basin in Montana, where she and her family have recently relocated. She is certified as PSIA Level III Alpine instructor.